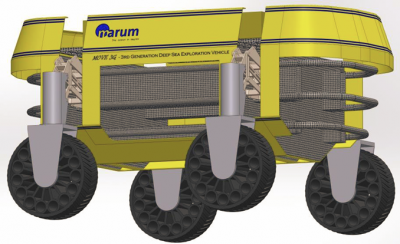 The CMOVE system that has been designed by MARUM will be used as a base for a dedicated development activity that will lead to a vehicle design that will make full use of lightweight construction materials and favorably also with non-magnetic properties. The focus is on the development of a mobile platform to carry seismometers, electromagnetic sensors and instruments for basic physical parameters. The aim is to allow for better quantification and localisation of gashydrates in deep-sea sediment. 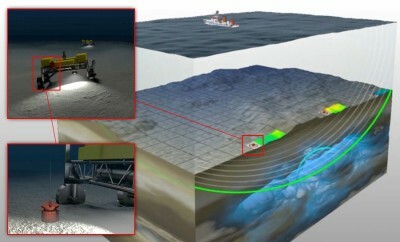 Going back to a concept that has been developed from GEOMAR a multi-crawler system will be developed that will be designed to allow for acquisition of seismic data over a certain area by letting the crawler array transect the region of interest collectively. This concept lends immediately to an analogous deployment scenario on the moon. For deep sea investigations the array of crawlers will also allow for taking EM measurements by spanning an antenna over the seafloor.